Le Husqvarna SMS 125 est un deux-roues de type Supermotard de la marque Husqvarna. Vous trouverez sur cette page une information complète concernant ce modèle (fiche technique, coloris, caractéristiques, prix, accessoires). The SMS 125 has become an icon among young first time bikers, a commercial hit and a new fashion must. It is the starting point for those who want to savour the thrills of an offroad style bike, but is also ideal for everyday commuting in town. 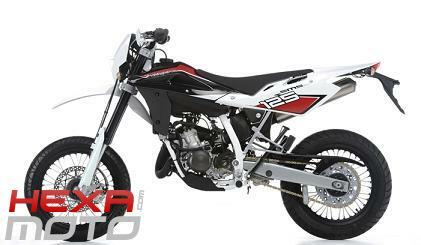 Easy to ride, light and easily handled, the 2011 version of the SMS 125 has what it takes to confirm its status as category leader. The bike is available in two colour schemes. The red and white colour scheme shared byall Husqvarna off-road models is now enhanced by the addition of bodywork graphics using"In–Mould Decoration", integrated to the plastic itself. The black and white version hasalso In-Mould Decoration. The bike is fitted with new handlebar guards. 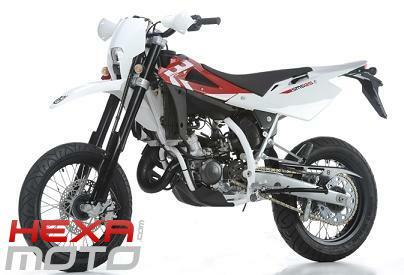 The white chassis and anodised black hubs make the 2-stroke look more like its 4-strokebig brother. 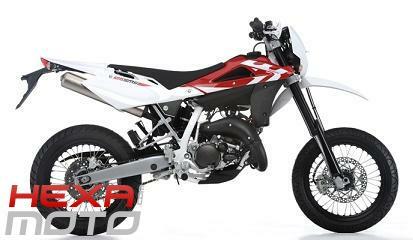 The tried and tested 125cc engine has been refined and brought up to datewith improvements derived from racing models, especially in terms of pick-up and powerat low to medium revs. The SMS 125 comes with the ECS electronic carburetion system, an integrated system forelectronic control of the fuel mix (both air/petrol and petrol/oil), developed incollaboration with Dell'Orto. The unit also controls the ignition system. This enables the2-stroke SMS 125 to meet Euro 3 requirements, contains costs, boosts commercialcompetitiveness and maintains all the advantages typical of 2-stroke engines: lightness,performance and low running costs. 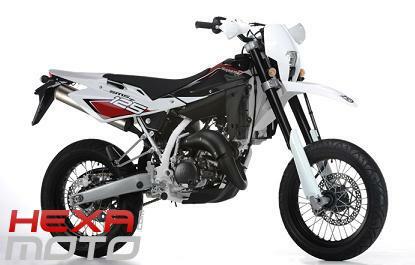 The new exhaust and silencer is derived from the125cc racing CR/WR. The suspension now features new Marzocchi front forks, specially developed for thismodel, further enhanced by the Sachs shock absorber with new calibration allowing greater flexibility and support. The rear light is LED and there is a new registration plate holder. The front light housing has also been redesigned and the headlight has a more powerful beam. Retrouvez les informations techniques du modèle Husqvarna SMS 125. Ces données techniques sont sans garantie et sous réserve de toutes modifications. Pneu arrière 140/60 - 17"
Voici les différents coloris disponnibles pour le deux-roues Husqvarna SMS 125. Voici les photos du Husqvarna SMS 125. Après avoir cliqué sur une des miniatures, naviguez facilement en utilisant soit les flèches de votre clavier soit la roulette de votre souris.